Preheat oven to 205-degree C (400-degree F). 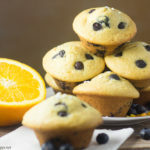 Grease the 12-muffin pan or put some paper muffin cups. Set aside. In a large bowl, combine the sugar and the orange zest. Rub them together with your fingers until the fragrance of the orange has been released. Add the flour, baking soda, baking powder and salt. Whisk them all together to combine. Pour the orange juice into a measuring cup. Add enough buttermilk in the same measuring cup to measure 1 cup. In a slightly smaller bowl, pour the orange juice and buttermilk. Add the eggs, honey and melted butter. Whisk them all together to combine. Pour the liquid ingredients over the dry ingredients in the large bowl. Mix gently with a rubber spatula. Add the blueberries and continue mixing, just enough to combine. The batter will be lumpy. Once cooked, let cool for 5 to 10 minutes, and then start removing each muffin from the tin. If using frozen blueberries, make sure you thaw them first. If you are using decorating sugar, take the muffin tin out of the oven after 10 minutes, sprinkle the sugar on top and then put it back in the oven to finish cooking. Adapted from 'Baking: From my home to yours' by Dorie Greenspan.